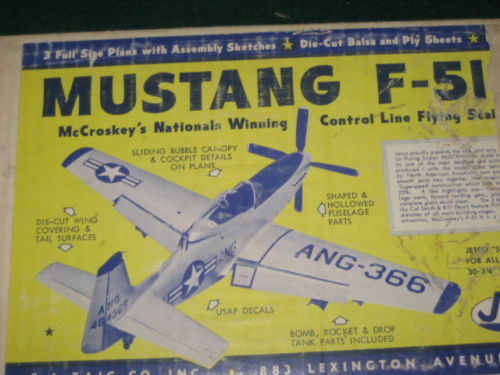 Payment | Shipping OLDER JETCO MUSTANG F-51 H 30″ C/L BALSA MODEL AIRPLANE KIT Click to View Image Album Click to View Image Album Click to View Image Album Click to View Image Album Click to View Image Album This auction is for a older Jetco Mustang P-51 H scale control line balsa model airplane kit. 30 inch wing. .19-.35 powered (engine not included). Includes pre cut and die cut balsa and ply, carved balsa fuse pieces, canopy, decals (some wear), landing gear, silkspan covering, hardware, plans (have a little writing on them) and instructions. Box does show some wear but still decent and kit is complete and not started. If paying other then Paypal email me after auction closes and I will forward my name and address. $13.50 shipping U.S. CHEAPER MIDWEST, $30.00 shipping Canada. $40.00 International shipping for all other countries. I combine auctions to save you money on shipping. I still have large amount of model airplane kits, engines and parts from the 50’s through the 90’s. Thanks for looking at my auctions. I am not a expert on everything I sell so please email me with questions or corrections. I don’t deliberately try to hide flaws, but sometimes I do make mistakes. I stand behind all my auctions (unless stated AS-IS)with a 100% money-back refund including shipping for returns or sometimes I will make a sales adjustment. Before you leave negative feedback, please give me a chance to make things right and I will do the same for you. I am very patient with my customers when it is time to pay so please keep me updated if there is a delay in payment for items. I will always combine auctions if possible and try hard to get close to actual shipping for all combined sales. I try hard not to overcharge for shipping, but since I estimate shipping for Midwest and East and West coast, sometimes you pay a little more than actual and sometimes I pay a little more than actual shipping. It usually evens out at the end of the year. I treat my International customers the same as U.S customers. I am in this business for the long haul so please don’t play games and bid on items that you have no intention of following through on. Good Luck on my auctions. Payment Back to Top I accept the following forms of payment: PayPal Shipping & Handling Back to Top $13.50 USPS Priority Mail® FREE scheduling, supersized images and templates. Get Vendio Sales Manager.Make your listings stand out with FREE Vendio custom templates! FREE scheduling, supersized images and templates. Get Vendio Sales Manager.